The first question Marissa Goodsky was asked when she interviewed for the apprenticeship program: Did she mind getting dirty? 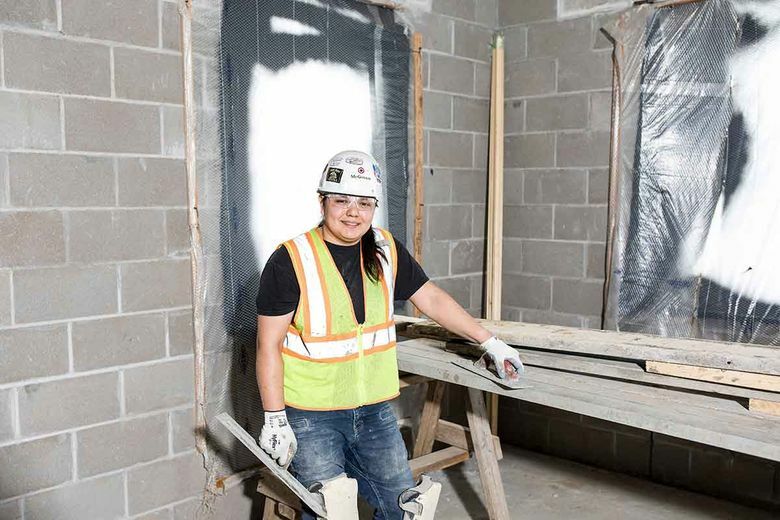 Marissa Goodsky, 27, is a concrete mason at McGough in Roseville, Minnesota. Q: What do you do at work? A: I’m in the final year of a three-year apprenticeship. I do everything from preparing the area where the concrete will be poured and creating forms to hold it, to pouring and smoothing it. We’re also called concrete finishers. I mainly use hand tools — trowels and edgers — but once in a while I get to operate a walk-behind power trowel. A few times I got to jump on a ride-on power trowel, which feels like a huge throne to me. Flat work, like floors, is my favorite so far, but decorative concrete is a close second. When: May 11, 9 a.m.-2 p.m.
A: I’m part of the Bois Forte Band of Chippewa and grew up on a reservation. After high school, I waitressed for several years and then started college for construction management. I saw a flyer about a three-month training program for cement masons through a partnership involving our Tribal Employment Rights Organization, the Minnesota Department of Transportation and Cement Masons Local 633. I enrolled in that, and was pretty proud I graduated. Years earlier, my older brother completed a similar program and an apprenticeship to become an ironworker, and he did well. I left school and was accepted for the cement mason apprentice program in 2015. Then the union helped me get a job, and I started work two days later. Q: What was your three-month training like? A: During the program at the union training center, we learned basic tasks, like the proper way to pound a support pin in the ground, and how to plumb and set a line to the right elevation so that the concrete will be level. It was pretty rigorous, but I like being physical and pushing myself. I still take classes there for my apprenticeship. I’ll finish this summer and become a journeyman. The next step is foreman. Q: What’s it like working with your crew? It’s the best part of the job. There’s another female finisher on my crew. When I got laid off last year, one of the guys filled my freezer with meat. I’m back in school now, and the whole crew supports me. If we have overtime, they tell me to skip it and go to class. Q:What is surprising about your job? The time we spend waiting for the concrete to set so we can smooth it. It sets when it wants to, depending on the temperature, the sun and the wind. Even with concrete from the same truck, one half could set sooner than the other. People might also be surprised about how dirty we get. That was the first question I was asked when I interviewed for this program: Did I mind getting dirty? I don’t, but it’s endless. Concrete dust is everywhere. It wears out your work boots. I’m filthy when I go home, and I can’t keep my car clean. A: Knowing exactly what the boss wants. Every foreman does things differently. Q: What do people ask when they learn what you do? A: They might say their driveway or their basement floor has a crack and ask what to do. I tell them I’d have to see it before I’d know.